Inspector Rudge does not encounter many cases of murder in the sleepy seaside town of Whynmouth. But when an old sailor lands a rowing boat containing a fresh corpse with a stab wound to the chest, the Inspector's investigation immediately comes up against several obstacles. The vicar, whose boat the body was found in, is clearly withholding information, and the victim's niece has disappeared. There is clearly more to this case than meets the eye - even the identity of the victim is called into doubt. June Whitfield returns as the deceptively mild spinster sleuth in three full-cast BBC Radio 4 dramatisations. Specially broadcast to mark the 125th anniversary of Agatha Christie's birth, these brand new dramas are based on three of her best short stories. 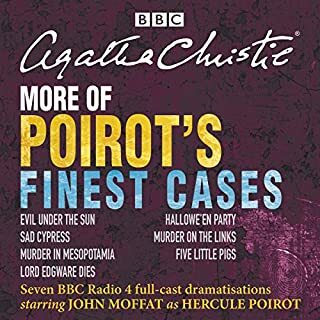 The Case of the Perfect Maid: Miss Marple investigates the problem of a lady's maid who has been mysteriously sacked – while also helping her crime writer nephew Raymond West to cure his writer's block. Sanctuary: Miss Marple and her god-daughter Bunch are horrified when they discover a dying man in the local church. Can Miss Marple deduce his identity – and his killer – from his last words? First published in the collection Miss Marple's Final Cases, these three delightfully clever tales will keep you guessing till the end. 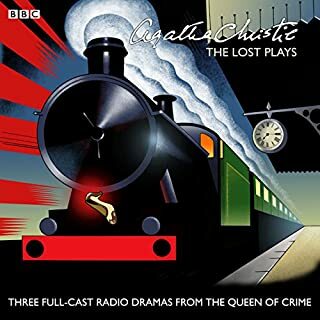 Starring June Whitfield – reprising her role as Miss Marple for the first time since 2001 – they are dramatised for BBC Radio 4 by Joy Wilkinson. An entertaining collection of stories, well layed out and cleverly dramatized. All the voices were great. Only complaint is it was shorter than I expected. 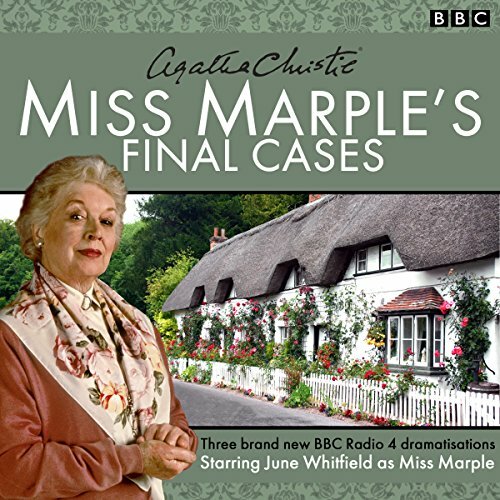 Would you listen to Miss Marple's Final Cases again? Why? Yes. I didn't know BBC planned to do any more of these books. 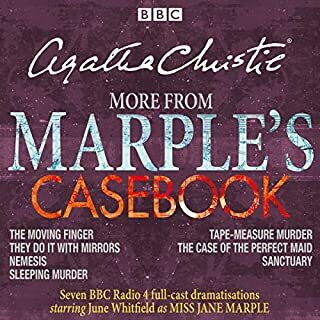 I was so excited that June Whitfield is still Marple. Perfect! Would you be willing to try another book from Agatha Christie? Why or why not? I've listened to all of her works. Which character – as performed by June Whitfield – was your favorite? The stories themselves are quick and rather dull, but the beauty of radio plays and familiarity of June Whitfield made it worth the purchase. This is a great road trip listen, it just comes alive and is so easy to visualize. Captivating. That was so enjoyable, took me back many years, loved every minute and was sad when it ended.. Stories like these will never lose their charm and the narration was excellent. This story really was amazing. I never caught on to who the murder was and the further into the story it got the more I enjoyed it and felt the intensity to it. Great performance and wonderful book. June makes an excellent Ms. Marple! Several very interesting cases of Miss Marple I've never encountered before. Well played by June Whitfield and the cast and well produced. A must for Agatha Christie fans. Gives me an appreciation on how it was long ago with radio serials.Well presented by the actors. I love Miss Marple's stories. Agatha Christie is one of my favorite authors. Anyone that likes a "cozy" mystery will like these short stories. I really enjoy the BBC full-cast radio dramas. This is narrated very well by all of the actors. I liked the sound effects and music in the background. It made for an enjoyable listen. 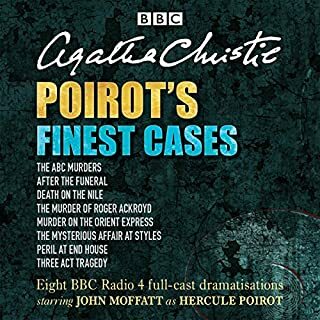 Although June Whitfield's performance is more subdued in this dramatisation , we have to consider that these are indeed Miss Marple's final cases and she's not getting any younger ( both the character and the performer ) ! I always think of June Whitfield as Miss Marple in the BBC dramatisations , so I was very happy that she was able to do these Final Cases . 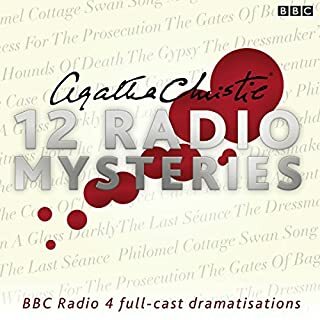 My only complaint is the dramatisations were very short but then I went on to listen to Miss Marple's Final Cases as read by Joan Hickson and each story was quite short as well . Miss Marple is my favourite Agatha Christie character and I thought this dramatisation was terrific . I love Miss Marple, always have. But I wish the cases in this collection had been a little longer and took a little longer to unravel. 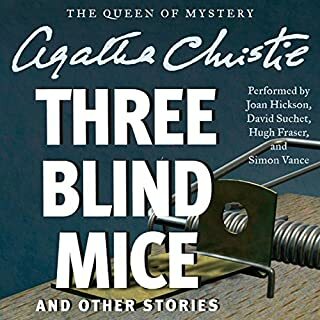 Also purchased Joan Hickson's narrated version and though there are more stories I do prefer this audio version, only wish there were more story collections of Miss Marple. Has a really good plot and is so nice to sit and listen to. June Whitfield is so soothing whilst she rears and it is my favourite audible book. I didn't realise, until I started to listen, that i have heard the stories before, with Joan Hickson. However, they were well dramatized and I did enjoy them, although it was all rather short. I love a story and these were great. Easy listerning. Fell I need some more like this. But jolly good anyway. Some people will prefer it, you just know what to expect.